AT GÜNBIL GERMAN SHEPHERD WE OFFER YOU OUR EXPERTISE AND KNOWLEDGE, ENJOY IT. Thank you for visiting Gunbil German shepherds. Our German Shepherd Quick tips are directed for most common question that arise. We hope that you find the information below effective and satisfying to your questions. You should never begin serious obedience training before your dog is seven or eight months old. While your dog is still in his puppyhood, concentrate on winning his confidence so he will love and admire you. Basic Training can be started at the early age of three or four months (preferably at four months). He should be taught to walk nicely on a leash, sit and lie down on command, and come when he is called. Schutzhund is a sport that focuses on developing & evaluating those traits in dogs that make them more useful & happier companions to their owners. The purpose of Schutzhund is to demonstrate the dog's intelligence & utility. It also measures the dog's mental stability, endurance, structural efficiencies, ability to scent, willingness to work, courage, & trainability. 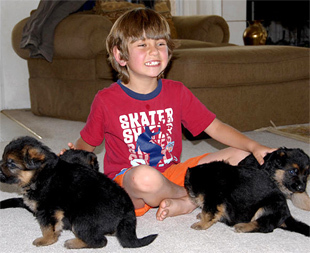 Breeding a schutzhund puppy is not sufficient if the early development is not handled correctly. A young schutzhund puppy should not be handled with a firm corrections. It is equally important that he/she should never be dominated by another dog. The training and play should have a positive ending with results equally satisfying both to the dog and the trainer/owner.